Tidewater Community College and the City of Chesapeake on Oct. 31 jointly dedicated the college’s new Precision Machining Lab on the Chesapeake Campus. The final event in the city’s month-long recognition of manufacturing in Chesapeake, the dedication included remarks by Mayor Alan P. Krasnoff and TCC Chesapeake Campus Provost Lisa Rhine. She thanked STIHL Inc., the Virginia Beach manufacturer of outdoor power tools, for donating three pieces of equipment to help launch the lab. Rhine announced the establishment of a TCC scholarship to provide assistance to Chesapeake high school students who pursue an Associate of Applied Science in Mechatronics. A $1,000 donation by Mitsubishi Plastics Composites America was matched by Sumitomo Drive Technologies, Yupo Corporation, GeoQuip Manufacturing, Inc., and Usui International. Chesapeake’s Department of Economic Development issued the Virginia Manufacturing Scholarship Challenge. “It was easy for us to start the Scholarship Challenge, and equally exciting to see others join us on this quest to attract the younger workforce to manufacturing careers of the future,” said Paul Olson, Mitsubishi plant manager. The Precision Machining Lab prepares students for work in advanced manufacturing on “smart” machines. The lab includes computer numerical control mills and lathes, a computer control surface grinder, computer measurement machines, along with numerous manual machine tools. The lab will be used by TCC students studying mechatronics, maritime technologies and engineering. It will also be used by Chesapeake high school students pursuing a Career Studies Certificate in Mechatronics with the launch of the new dual enrollment program between TCC and Chesapeake Public Schools. Tommy Babcock of Chesapeake, a second-year engineering student at the Chesapeake Campus and the founding president of the new Science and Technology Club, said he chose TCC to save money on college, but found much more. “The supportive faculty here on campus were eager to help since day one and provided the necessary knowledge and skills needed to help me through difficult concepts,” he said. 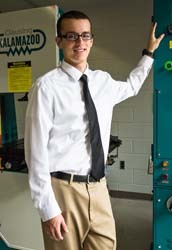 Babcock is the first STIHL Scholar, receiving a $5,000 scholarship funded by STIHL Inc. to cover tuition, books, fees and tools during his final two semesters at TCC. The lab dedication and Manufacturing Month events are the latest developments in a partnership between TCC and Chesapeake’s Department of Economic Development. In August, they hosted an Advanced Manufacturing Workforce Summit to address 21st century workplace readiness skills. Nearly 30 Chesapeake manufacturing representatives participated in this discussion with TCC and city leaders.